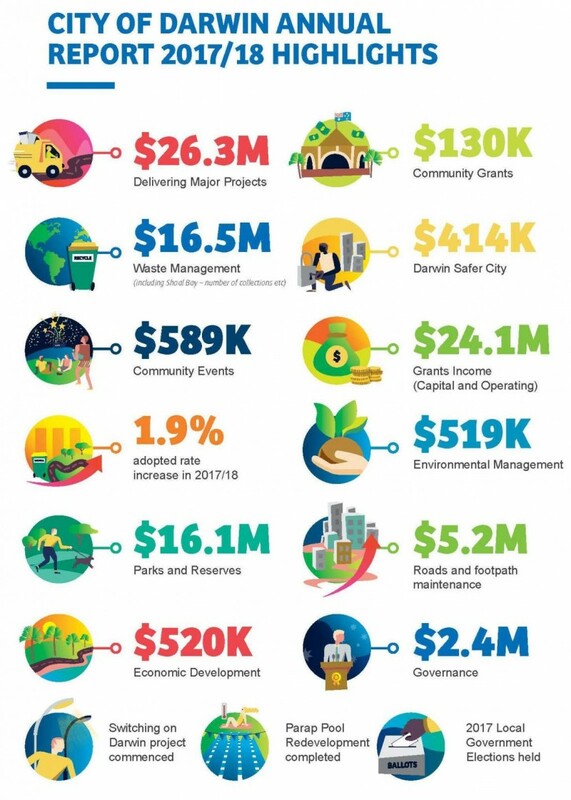 Annual Report provides an insight into the City of Darwin’s performance over the year against the goals and outcomes of the Evolving Darwin Towards 2020 Strategic Plan, Annual Municipal Plan and budget. It has been a year of great challenge and change for City of Darwin. The annual report is one of Council’s main documents that communicates to the community and stakeholders about the services it has delivered, the projects it has undertaken, and its key achievements during the financial year. City of Darwin now has a renewed focus on its vision to enhance Darwin as a tropical, liveable city that creates opportunity and choice for our community after facing unprecedented challanges loss of several key people from organisation and the devastation left by Cyclone Marcus. One of the key outcomes for 2017-18 was the completion of the $15.4 million Parap Pool redevelopment. This investment into the Parap Pool ensured that it became Darwin’s first FINA compliant 50 metre and 25 metre pools and puts Darwin on the map to host national swimming competitions. A new alternative way to pay for parking with PayStay was introduced, making it simple, easier and more convenient for people parking in the CBD and around 12,000 young children aged up to five years old have benefitted from a new purpose-built Fun Bus that travels around our parks and open spaces throughout the year. Council continues to build strong and collaborative relationships with key stakeholders such as the Australian Government, Northern Territory Government and Charles Darwin University in relation to a number of major projects such as Switching on Darwin, Smart Cities and the Darwin City Deal.